For home builders, using effective calls-to-action (CTAs) on your website can convert more of your website visitors into leads. A CTA is a simple image with a direct message, such as “Download Our Free eBook” or “Subscribe to Our Blog.” These images link to a landing page where visitors enter their contact information in order to download, subscribe or complete any other action the CTA invites them to perform. A strong CTA strategy can result in increased visits to your model homes or show rooms and can ultimately lead to more home sales. Check out these best practices for implementing effective home builder CTAs! Use Direct Wording: Short, direct and action-oriented phrases create a strong call to action. Merely suggesting readers take a look at information often does not compel a visitor to click and download the content. Give the user specific instructions about the action you want them to perform. Here are some examples. Make it Noticeable: If your CTA is only on one page of your website and small, it is very unlikely to attract attention. Integrate your CTAs into your webpages, including blog posts and home pages. If a visitor is reading a blog post, they are likely interested in receiving more info from you. Having a CTA at the bottom of blog posts may attract the visitor to gain even more information, and the CTA funnels them to related information. Additionally, having a design that stands out on the page is recommended. Using color schemes that blend into the page can cause your CTA to be lost to the viewer, no matter how great the content. Use contrasting (but complimentary) colors to make your CTA pop on your pages. If your pages are different colors, having CTAs with the same content can be helpful for design purposes. Provide Multiple Offers: Having one content offer throughout your entire website is not advised. Using different CTAs for different content offerings throughout will allow viewers to download content that they are interested in and help you qualify what your lead’s pain points and concerns are. A lead that has downloaded an E-book about popular parks and school systems in the area is most likely a family. You can use this information to send more helpful content about their pain points and help close the sale. If there was only one CTA, you would not be able to gain as much information about your leads. Use Alt Text: Many computer users do not update their browsers when prompted. Although it is not in your control, it can cause issues with images on your page. Entering “alt text” (short for “alternative text) for all images is recommended because of this situation. If your CTA doesn’t show up correctly because of a browser issue, website visitors will still be able to recognize it as a CTA if you include alt text with the image. Implementing these recommendations into your CTAs can help your business gain more qualified leads and gain more foot traffic in your model homes. Now that you know how to create effective CTAs, go a step further and check out our landing page best practices to further ensure visitors download your offers! 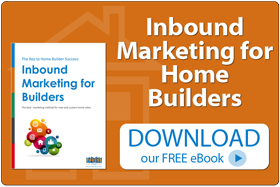 This entry was posted in Blog, Builders & New Home Marketing, Inbound Marketing. Bookmark the permalink.